This week’s shooting incident in Lake City makes me glad that the Northfield School District has an Emergency & Crisis Management Plan, revised in 2010. However, there’s one big problem with it. Section 2.29 of the District’s plan, Post-Crisis Intervention Procedures, advises that district leaders consider interventions known as Critical Incident Stress Debriefing (CISD) or Critical Incident Stress Management (CISM). CISM is "designed to help people deal with their trauma one incident at a time, by allowing them to talk about the incident when it happens without judgment or criticism" (Wikipedia reference). Neither Carleton College nor St. Olaf College have CSID as part of their crisis management plans but it’s evidently not by design, according to those I contacted. I think it’s safe to assume that if there were a traumatic event of some kind at the colleges, post traumatic event counseling would be made available. I’ll invite some Northfield area psychologists, therapists and counselors to chime in here with their comments and questions in hopes that we all can get smarter about this issue and be better prepared should something bad happen. The premise of CISD is that when people have experienced a traumatic event they should air their feelings as soon as possible, so that they don’t bottle up these feelings and develop post-traumatic stress disorder. In a typical CISD session, which lasts three to four hours, participants are asked to describe the traumatic event from their own perspective, express their thoughts and feelings about the event, and relate any physical or psychological symptoms they are experiencing. A facilitator emphasizes that it is normal to have stressful reactions to traumatic events, gives stress management advice, answers questions, and assesses whether participants need any additional services. Numerous fire and police departments have made CISD the treatment of choice for officers who, like Gary Felice, witness horrific events—indeed, some departments require it. It is also widely used with civilians who undergo traumatic experiences. Following the September 11, 2001, terrorist attacks, more than nine thousand counselors rushed to New York City to help survivors deal with the trauma and prevent post-traumatic stress disorder, and many of these counselors employed psychological debriefing techniques. Psychological debriefing sounds like an effective intervention, doesn’t it? An ounce of prevention is worth a pound of cure, and surely getting people to talk about their feelings, instead of bottling them up, is a good thing. Or is it? Let’s put CISD aside for a moment and consider another approach. Instead of asking Officer Felice to relive the trauma of Tommy Schuppel’s death, suppose we let a few weeks go by and see if he is still traumatized by the tragic event. If so, we could ask him to complete, on four consecutive nights, a simple exercise in which he writes down his deepest thoughts and emotions about the experience and how it relates to the rest of his life. That’s it—no meetings with trained facilitators, no stress management advice—just a writing exercise that Felice does on his own four nights in a row. Which approach do you think would be more effective—CISD, in which people express their thoughts and feelings right after a traumatic event with the help of a trained facilitator, or the writing technique, which people do in private weeks after the event? If you are like me (and the hundreds of police and fire departments that use it), you would put your money on CISD. Surely early interventions are better than later ones, and offering people the services of a trained professional is better than asking them to sit and write by themselves. But we would be wrong. It took research psychologists a while to test CISD properly, in part because it seemed so obvious that it was beneficial. When they did, they found something unexpected: not only is CISD ineffective, it may cause psychological problems. In one study, people who had been severely burned in a fire were randomly assigned either to receive CISD or not. Over the next several months, participants completed a battery of measures of psychological adjustment and were interviewed at home by a researcher who was unaware whether they had received CISD. Thirteen months after the intervention, people in the CISD group had a significantly higher incidence of post-traumatic stress disorder, were more anxious and depressed, and were less content with their lives. Similar results have been found in studies testing the effectiveness of CISD among emergency workers. Unfortunately, this message has not been widely disseminated or heeded. In 2007, after a disturbed student at Virginia Tech University killed thirty-two students and faculty, students and emergency workers underwent stress-debriefing techniques similar to CISD. What about the writing exercise? This technique, pioneered by social psychologist James Pennebaker, has been tested in dozens of experiments in which people were randomly assigned to write about personal traumas or mundane topics such as what they did that day. In the short run, people typically find it painful to express their feelings about traumatic experiences. But as time goes by, those who do so are better off in a number of respects. They show improvements in immune-system functioning, are less likely to visit physicians, get better grades in college, and miss fewer days of work. Chapter excerpts from Wilson’s book can be found here. I have little faith, or even tolerance, for self-help books of any kind that claim to have the one and only solution/technique for dealing with any sort of problem. There’s an element of trying to ‘fix’ everything that is a traumatic experience that is ridiculous in this way: everyone has a different personality and way of personally functioning. What is helpful for one person may not be a helpful [process for another; what is the right time to talk about it may be different for different people. It is only common sense and empathy for the pain of others than should tell us that the affected person should be comforted, offered any and all available help, and let the person affected tell what would be most helpful to them, and when. ‘Experts’ who have a one size fits all approach to deal with experiential trauma are bound to be wrong for some of the people, some of the time, if not most and most. Sincere compassion, honestly communicated, is what is helpful, not necessarily ‘technique’. Kiffi- Excellent observations. I agree across the board. Kiffi, the problem is that ‘common sense’ in these kinds of situations is often wrong. And people’s judgement about what they need or what they received is often wrong. Wilson cites examples of people, including public safety professionals, whose personal testimonials about the CSID that they received was helpful to them, even though the long term follow-up shows that it wasn’t. If someone who had witnessed a traumatic event was still having trouble two weeks after the event and sought counseling, common sense tells us that a compassionate listening/supportive approach would be fine. Research says that that’s not necessarily so, maybe even harmful, and that a structured writing technique is better. My point is only that as we seek solutions to problems, one solution after another is sought and tried, and for a time is the preferred treatment. So I have to conclude that throughout all these trial and error periods of differing preferred techniques, that compassion for one another’s problems will always be helpful, and the most broadly useful. Kiffi, it’s not what Wilson says is better. It’s what the research says. One of the main points of his book is that millions upon millions of dollars are spent trying to address social problems with seemingly common sense programs without doing any research on them first. Unintended consequences are legion because we humans are complex creatures. So broadly speaking, yes, compassion for one’s fellow human being is a universal good. But in this instance, a compassion-oriented treatment approach (CISD) by a professional is not warranted. Griff- I think Kiffi is correct about the use of compassion. What a person does next to resolve those tramatic experiences is where the difference comes in. I don’t think we can come up with a “one size fits all” solution, being that we are complex creatures. I don’t think you are saying that this new writing method supercedes the CSID practice, are you? It would seem that the writing procedure is one more tool to use. I also think that some people will always have lifelong effects of a traumatic experience, depending upon their particular temperament. We all vary in how quickly and thoroughly we can get beyond certain experiences. John, I’m only referring here to the use of CISD by trained professionals. Compassion showed by friends and family members for the traumatized is not the focus. But Wilson’s point is that the research shows that CISD should not be used… that if a person is still having trouble a week or two after a traumatic incident, then the writing technique is not only more effective but that it avoids the possibility of an intervention (CISD) that makes their problems worse. Griff- That may very well be that the writing exercise is more effective for some people, but I think the case Kiffi and I are making is that it is not a universal medicine that will produce consistent effects in all people. For instance, aspirin is a good medication for headaches and is effective for certain heart conditions. I cannot take it because of other medications I have to take, so even though aspirin is effective for the great majority of the population, it is dangerous for the segment I happen to be in that take an anti-coagulant medication. The involvement of trained professionals in these incidents is probably key to any effective treatment procedure used. Kiffi, I too am reading this book, and the point that it makes is that research, especially the randomized clinical trial (RCT) provide the best test of whether a specific technique is delivering results or just hype. The conclusions about the invalidity of the CISD method in general is quite sound. The response that each individual’s response is personal and different is just a restatement of the fact that the predictions are for the average person. The exceptions (outliers) are hardly the best guides for large group decision making. If you look at the before and after plots (which I do, a lot) you will always see examples of people that were above average before the intervention and who are below average after. There will also be those who were below average before and above average after. I can guarantee you that the testimonials that are often used to boost any “common sense” solution are cherry-picked from the outliers who showed improvement. But the average outcome guides us much better, and if the science says CISD on average is harmful, then we should ask our large institutions to behave accordingly. Griff, in response to your request for clarification of the pros and cons for a community to require that emergency response crews follow the Critical Incident Stress Debriefing (CISD) proposal, I read a paper on this subject by Jeffrey T. Mitchell, Ph.D.
Clinical Professor of Emergency Health Services at the University of Maryland. His description of the CISD and its procedures sems rational and reasonable. Dr. Mitchell explains that the CISD procedures are only to be used with a group of people who have all experienced the same trauma. This is not an individual therapy approach for a person who has experienced trauma! Second, the CISD instructions are clear that these group-oriented debriefings are not the first order of business in a trauma situation. that the debriefing should probably not take place until between 24 and 72 hours after the critical incident. I mention these two characteristics of a CISD in particular, because in reading the segment of Tim Wilson’s book that you included in your blog, there is no mention of either of these two key CISD components as being critical for understanding how CISD works, nor was there an indication of whether research done with CISD took these components into consideration for the research design. Professor Bruce, good to have your input on this! I read the paper you cited. Jeffrey Mitchell is the guy who developed CISD in 1974. There’s no date on that paper but it appears to be around 2006 since the research he cites is all prior to that. I’ll try to find out whether the research Wilson cites takes into account the two elements you mention, ie, that CISD be done in a homogeneous group and that it be done days after the incident, not immediately. The CISD small group process was not designed to manage any of these types of cases. It was developed for use with small, homogeneous groups such as fire fighters, police officers, military and emergency services personnel. CISD should be used for staff, not primary victims. And yet later in his paper, he cites the positive research results from CISD on traumatized bank employees and workers in the World Trade Center attacks, ie, “primary victims.” He appears to want it both ways. CISM is also considered comprehensive in that it consists of interventions which may be applied to individuals, small functional groups, large groups, families, organizations, and even communities. Note: they include ‘individuals.’ Does that seem weird to you? The term “primary victim” may be confusing. For workers in the World Trade Center, they were certainly primary victims, quite as you point out. I’d guess that for Mitchell, the acceptability of the CSID approach for them is the large number of people involved, so that they see themselves as “one of several/many”. As such, they are really like “staff” who have been through the trauma together, and thus they would fall within the proper CSID debriefing procedures. The International Critical Incident Stress Foundation certainly does identify individuals — contrary to Mitchell’s admonitions. Not sure what to say here. I suppose it is not surprising to find people using a process that works in one type of situation in a different situation. Here, of course is where the research cited by Wilson could be identifying an important underlying fault-line of a CSID “reach to far”. Bruce, I just noticed that Mitchell is President Emeritus of the International Critical Incident Stress Foundation. So he must know of their all-encompassing recommended use of CISD, despite his contention that it be used for staff only. Sorry it took awhile for me to get back to you. I haven’t read this particular work by Timothy Wilson, but I’m familiar with some of his earlier research on decision-making. It’s pretty solid. He’s a big fan of researching conventionally held assumptions and finding them not to be true. I’m a cognitive developmental, not a clinical or counseling psychologist, which means (as I tell my relatives) that I don’t work with crazy people (other academics excepted). But, I am a fan of the idea that we need empirical research to test people’s intuitions (even, and maybe especially) those that are strongly and passionately held. Because it’s quite possible to be very certain AND very wrong about what works–one sees this in decision-making research all the time. A gal I went to grad school with, Susan Nolen-Hoeksema (ph. d) has done a bunch of research suggesting that one reason women show roughly twice as much depression than men in our culture is that women tend to “ruminiate” on problems–men tend to ignore them and go play basketball (ok, that was a gross oversimplification). Susan provides compelling empirical evidence relating gender differences in rumination to gender differences in depression, and I think that this is probably related to what Wilson in finding/summarizing. Now I’ll just have to go read his book! 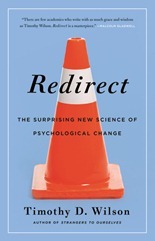 It’s interesting that one of her recommended interventions is “Reappraising negative perceptions of events” which appears to be what Wilson is referring to with his book Redirect and more specifically with the writing technique instead of CISD. Wilson also challenges other programs designed to address social issues, including more that we have here in Northfield. More on that to come! I’d hazard to guess that there are some events where “reappraising negative perceptions” would be quite difficult, if not impossible. Phil, what might those events be? Everything can be taken from a man but one thing; the last of the human freedoms – to choose one’s attitude in any given set of circumstances, to choose one’s own way. Yes, Griff, sometimes our messengers ride off in different directions than we intended – even when we ride alongside, or at least, used to ride alongside. But if the point being made by your initial post on this subject is that emergency crews in the Northfield area should be thoughtful about using CISD recommended procedures, then regional emergency managers can use their informed judgments re: which course of action to recommend. But perhaps you had a larger issue to illuminate in this string of voices? Bruce, this blog post is just about this specific policy of the School District. If something traumatic happened at one of the schools, there’s little doubt that CISD would be deployed by administrators for the benefit of affected staff, students, and parents. Everyone would just assume it’s the best thing to do. I certainly would have made that assumption prior to reading this book. Wilson, of course, has larger issues re: the need for research before adopting social programs. Should the school district want to review their policies, it seems that you have provided some important questions for their professional staff to consider. I like that. Thanks for raising these questions, Griff. Well said! i wish the School District could start to understand and use actual research findings to guide their decision making. But given their track record, I think it’s a pipe dream. Administrators in the School District, particularly the Superintendant and those at NHS, show little evidence that they know what a randomized controlled trial is, much less why its valuable. So much of their decision making is guided by personal intuition, habit (aka “we’ve always done it this way” or “it is our policy that”). Examples: Using the DARE program in 5th grade, when good research shows it doesn’t work; taking instructional time away to do a “Virtues” retreat or the LINK welcome (kindness in 4th, respect in 9th, something else in 7th) with not only no evidence that these have any effect, but no intention to ever find out if they do; PLCs at the high school (the other schools at least seem to have non-laughable measures of outcome, at least according to the SITE improvement plans), overall curriculum delivery (possibly excluding math and art) at the high school. Evidence is trumped, over and over again, but “feelings” of “professionals” eg., staff. No one asks parents or students. And there are few standardized measures of any kind–just teacher intuitions–that drive curriculum and instruction. And when you try to develop teacher accountability measures, the teachers (at the NMS and NHS) scream that it can’t be done. (Elementary teachers are already on the hook with MCA scores–and for the most part, they seem to work their butts off and USE data to inform their instruction). Northfield isn’t alone in its insistence on relying on the “gut feelings” of a handful of individuals vested in maintaining the status quo, of course. It’s just immensely disappointing that, in a town like Northfield, we taxpayers let them get away with it. Kathie, Wow, that’s quite a list of ills. But I appreciate the examples you describe. You know much more about the school system than I do! I suspect that you are quite right about decisions for instituting nice-sounding programs in the school system — that they are based on beliefs (and ideologies), not research results that show that they work as advertised. On the other hand, it has long been my contention that we in psychology and sociology have not done a good job of translating our research into language and formats that can be adsorbed by busy professionals (say in education). There are exceptions, of course, — Carleton’s own, Parker Palmer, is a good example! Oh, nobody in the US *ever* asks students whether they learned anything or what worked, even in Ithaca, NY. Let alone do controlled studies. I don’t know how to fix this. I am cynically unsurprised to see that the town I went to college in has the same underlying social problem with the school system as the one I grew up in (also a two-college town). You’d think having professors everywhere would make the school district more evidence-based, but it doesn’t. Thanks for posting this, Curt. An unbelievable overreaction to a natural disaster. I fixed your typo so hopefully now you’ll be able to begin the hard work of getting over your shame.